In culinary school, you spend an entire day just on eggs. That's how important they are. Before you try to impress a chef about your knowledge of sous-vide cooking, you have to master the basics. 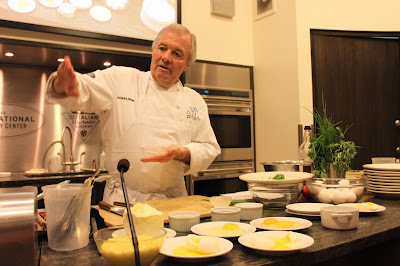 And to help the students at The International Culinary Center nail them down, the school invited the master himself, Jacques Pepin, to demo every possible egg preparation. He made them look easy. Really easy. But with years of practice, that's what happens. We flagged five of his most memorable tips. 1. Crack your eggs on a flat surface. The simplest part of an egg dish is cracking the shell, but I bet you're probably guilty of cracking it on the edge of a counter or bowl, right? Well, don't. You're more likely to end up with pieces of the shell inside your dish. 2. Poaching eggs? Fresher eggs are better. The older the eggs, the more the whites will tend to spread in the water. A dash of vinegar will help corral the web-like whites, but stick to fresh eggs for an easier attempt. 3. Butter is the key to a smooth omelet. French omelets should be perfectly smooth and beautifully yellow, and there are three keys to nailing this down: a) Practice, duh; b) A very hot, non-stick pan; c) don't drown the pan in unsalted butter or else your omelet will be wrinkly (1 tablespoon butter is enough for a 6 to 8-inch pan). 4. Whisk your scrambled eggs. When making scrambled eggs, it's best to have the smallest possible curd during cooking. To achieve this, use a whisk and constantly whisk during cooking. Reserve a 1/4 cup of your egg mixture, and when the rest of the eggs are starting to set in the pan, pull off the heat and add the raw eggs. That way, you'll guarantee that you won't end up with rubbery, overcooked eggs. 5. Think outside of the pan. One of the most delicious (and easiest) ways to prepare eggs is to use a ramekin: Butter the ramekin, season it, and line it with whatever ingredients you have a hankering for (think: herbs, ham, tomatoes). 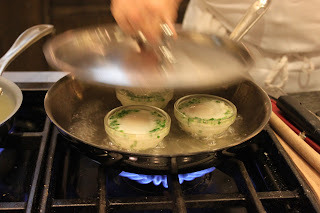 Then, crack an egg on top and place the ramekin in a large saucepan filled a quarter way with water. Cover and let boil until the whites are set, but the yolk is still runny, about 4 minutes. Jaques also advises a dash of vinegar in the salted water when you boil eggs, too. If an egg is broken, the white will not leak out and will remain inside the shell.